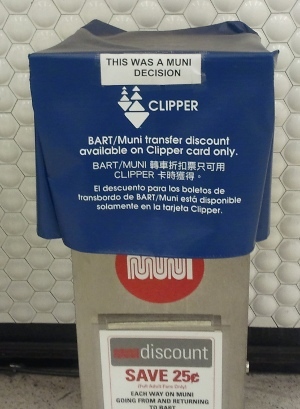 This was a Muni Decision! Found at Montgomery station. Is BART getting complaints from cash passengers no longer getting their transfer discount? Not sure if it’s the “jewel in BART’s crown” as described by the spokeswoman, but there’s no question that Balboa Park station is one of the most heavily used and most in need of improvement in the system. In particular, riders who transfer from BART to Muni Metro and vice versa today face a very confusing and sometimes dangerous street layout where there should be an easy-to-navigate transfer station. It’s not clear from the proposal (click on “Balboa Park” links, all pdf) which improvements for Muni are included, but there’s no doubt that proposals for easier access J, K, and M platforms as well as pedestrian safety improvements are badly needed. We’ll keep an eye on this project after groundbreaking this Friday. Good news on the Oyster, Octopus, SmarTrip, Suica style smartcard front: Testing of Translink on BART has been successful, and the cards will be supported “within a month.” Not coincidentally, the Translink working group recently fired the contractor responsible for many of the recent delays. If you don’t have a Translink card, sign up now! Regional commuters on BART are likely to see fares and fees go up this year due to budget shortfalls, today’s Chronicle reports. Among the options being considered are reduced frequency on weekends (from a frequency that is already quite low), higher parking fees at peak demand times, and deferred maintenance. Other regional systems are facing similar shortfalls, mainly due to lower tax revenues in the slowing economy, despite increased ridership. Caltrain just increased fares at the beginning of the year, and although SFMTA is in the middle of a two year budget cycle, it too is facing higher costs and lower revenues. You are currently browsing the archives for the BART category.